Experience the best of life in West Palm Beach, Florida, in one of our luxurious Loftin Place Apartments spaces. 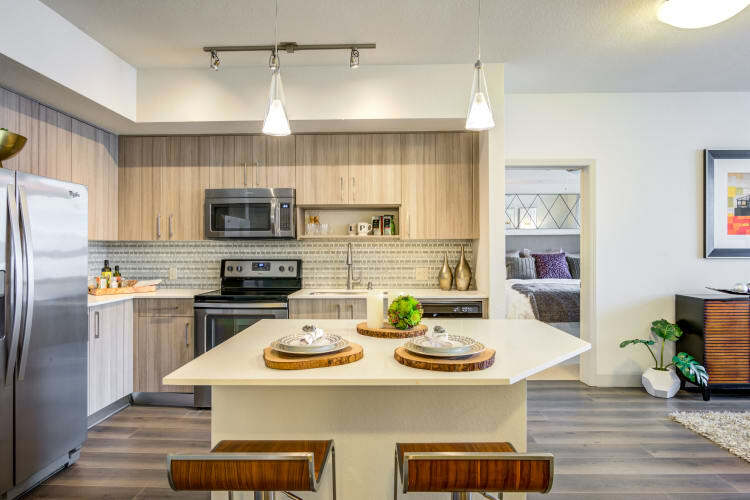 With a variety of floor plans available, ranging in size from 578 square feet for a cozy studio to 1,050 square feet for a spacious two bedroom, you’ll have no trouble finding the right place to call your own. Regardless of which home you choose, sky-high ceilings and large windows mean mornings bathed in natural light. Other high-end features like sophisticated vaulted ceilings, cold-blowing air conditioning, and a luxurious oval bathtub elevate each new day above the last. Welcome to the luxury you’ve been looking for. We offer a bevy of amenities designed to help you get the most out of every single day. Entertain friends and family in your sparkling, chef-inspired kitchen featuring polished quartz countertops, energy-efficient stainless-steel appliances, and handsome custom cabinetry. After the party’s over and it’s time to clean up, you’ll appreciate convenient features like easy-to-sweep wood-style flooring, a dishwasher, and a washer and dryer. When the chores are all done and your guests have gone home, don’t forget to give yourself a moment on your private balcony or patio to toast another day well-lived. Contact our professional leasing team today to set up your personalized tour.